This week Z finally got to activate the library card that Santa put in his stocking and he picked out a couple of books. I don't think that he could have chosen a more random set of books. 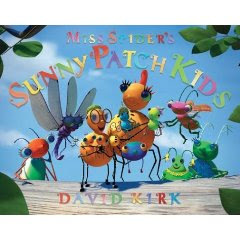 One of Z's favorite set of characters are David Kirk's Sunny Patch bugs. This book, Miss Spider's Sunny Patch Kids, is the story of the formation of Miss Spider's family. She has five little spiders of her own and adopts a dragonfly, a bedbug and a jewel beetle. The little family finds an egg and must help reunite it with its mother. This book is written in verse so it has a nice rhythm to it. The pictures are bright and happy and the message is that all mothers love their babies. 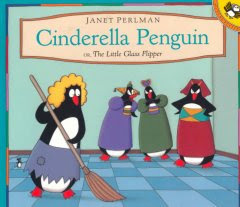 The second book that Z pulled from the shelves is the starkly different Cinderella Penguin or The Little Glass Flipper by Janet Perlman. This author has written a few similar books of classic fairy tales starring penguins. Apparently this book was based on an animated film. This is the standard Cinderella tale with a wicked stepmother and two terrible stepsisters. The illustrations are cute -- I've never seen so many angry and mean penguins though! And if you want a strange mental picture, think "penguin in a corset". 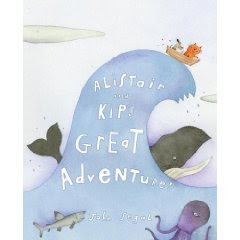 I chose the third book, Alistair and Kip's Great Adventure! written and illustrated by John Segal. This is a great little book from 2008 about a cat (Alistair) and a beagle (Kip). They build a boat and set off on a voyage to the ocean. They are overturned by a large wave and go deep into the sea. They find what they think is an island but it is really a whale. Luckily, it's a very kind whale who is willing to help them get back home. I really like the illustration style in this book. Z however, is less than thrilled that the dog is drawn smaller than the cat and he insists that it is really a story about a cat and a mouse. I'm glad that Z doesn't have any prejudices yet about books being for girls or boys. I can't wait to see what he picks next time! Buy Miss Spider's Sunny Patch Kids , Cinderella Penguin: Little Glass Flipper and Alistair and Kip's Great Adventure! on Amazon or find them at your local library.